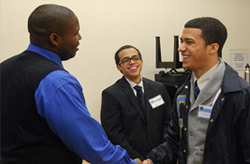 To build a brotherhood of future leaders. To instill in each of its members the values and traditions taught in the Gamma Motto, Philosophy and Creed. We P.U.S.H (persist until something happens) our members to display the ambition, drive, confidence and the commitment needed to excel in all of their future endeavors. We are the example of what happens when an organization treats its members with the dignity and RESPECT!